Although I was looking forward to this movie from the first trailer I saw, I went in with mediocre expectations. 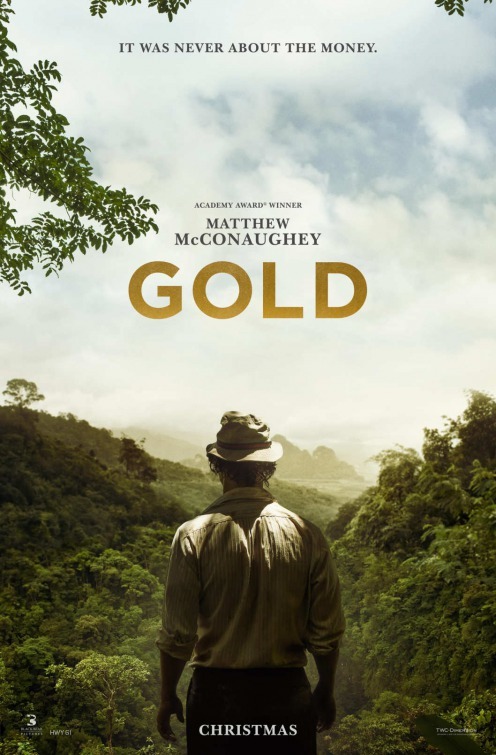 From the outside looking in, Gold had all the signs of a box office flop (remember McConaughey's Sahara, anyone?). I’m happy to say my intuition was wrong. Gold delivered. For such a simple premise, there’s a surprising number of twists and turns in this movie. Matthew McConaughey plays Kenny Wells, a wheeling, dealing, down-on-his-luck prospector who owns a small family mining business. When he hits rock bottom (no pun intended) during the recession of the late 80’s, Wells has a vision of the mother lode in Indonesia. Using every last dollar to his name, Wells convinces famous geologist Michael Acosta (played by Edgar Ramirez) to help him stake a claim and open up a mining operation. What follows is a wild, roller coaster ride with excellent pacing that’ll keep you enthralled and guessing until the very last scene. McConaughey shines as Wells. He’s equal part lovable idiot, jackass, and good 'ole boy. But most importantly, during the wild ups and down, he’s believable. You find yourself wondering if you’d be any different in his place. The character shines by himself but plays well with the rest of the cast, especially his business partner, Acosta, and his practical, down-home girlfriend Kay (played by Bryce Dallas Howard). The chemistry and timing of these three rang true -- Gold wouldn't have been the same without Ramirez or Howard. It would have been easy for Gold to fall down the raunchy comedy rabbit hole (it didn't), and the film does have its comedic moments, but it also carries a sobering message about how wealth affects individuals and our society as a whole. Amidst a box office lineup of tired, overdone sequels, Gold isn't a movie to miss.